The number of stations used to derive the index is shown in color. The color scale is displayed at the right of the plot. 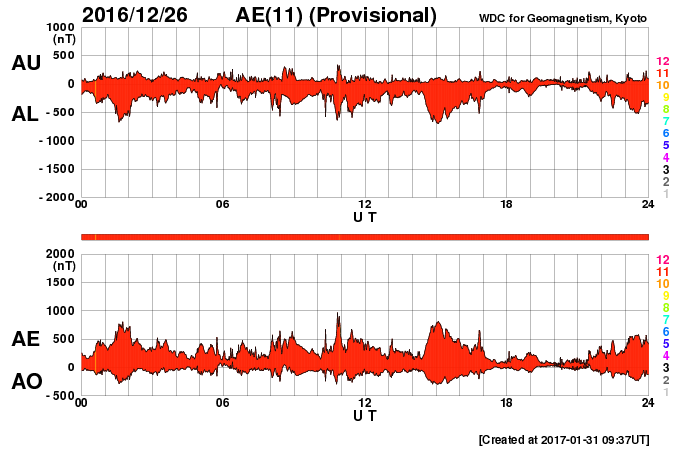 Users should note that a loss of only one station could miss significant disturbance events. Acknowledgments: We thank AE stations (Abisko [SGU, Sweden], Dixon Island, Cape Chelyuskin, Tixie Bay, Pebek [AARI, Russia], Barrow, College [USGS, USA], Yellowknife, Fort Churchill, Sanikiluaq (Poste-de-la-Baleine) [GSC, Canada], Narsarsuaq [DTU Space, Denmark], and Leirvogur [U. Iceland, Iceland]) as well as the RapidMAG team (NiCT, JHU/APL, UoA, AARI, and IDG) for their cooperations and efforts to operate these stations and to supply data with us for the provisional AE index.